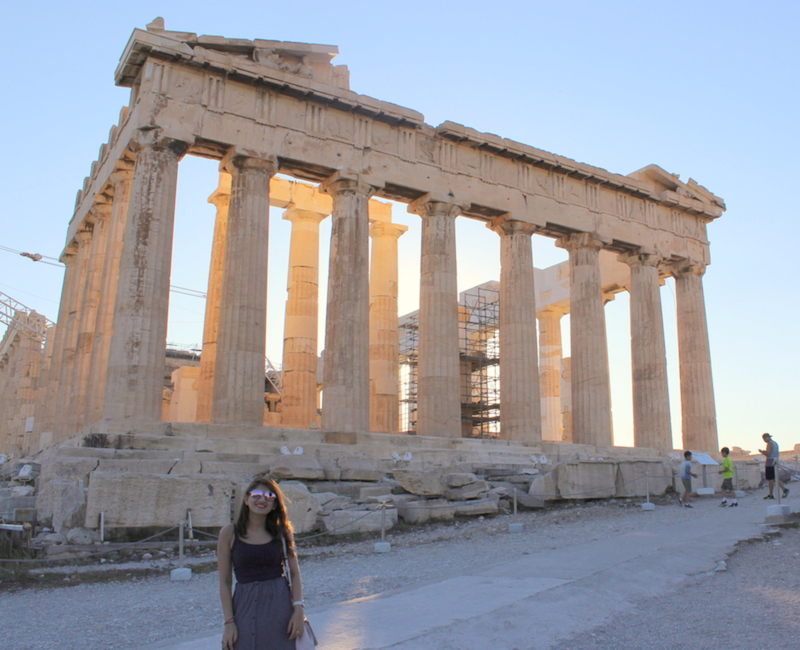 Read all about our trip to Athens, Greece! They say travel helps you grow as a person, well I would not deny that. It was my very first time to Europe & it was with my better half. 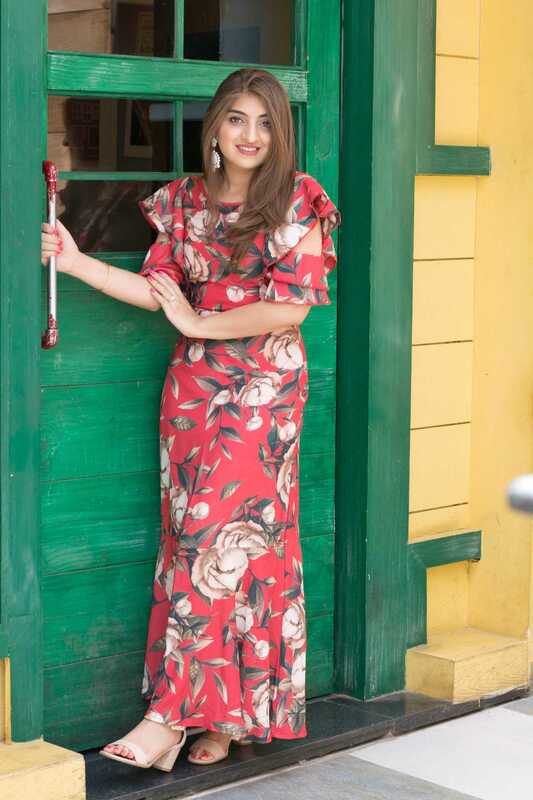 We were very keen on travelling to places that were beautifully romantic, had a lot of beaches & the sunny summer weather, as I wasn’t prepared to travel those countries in the winters. 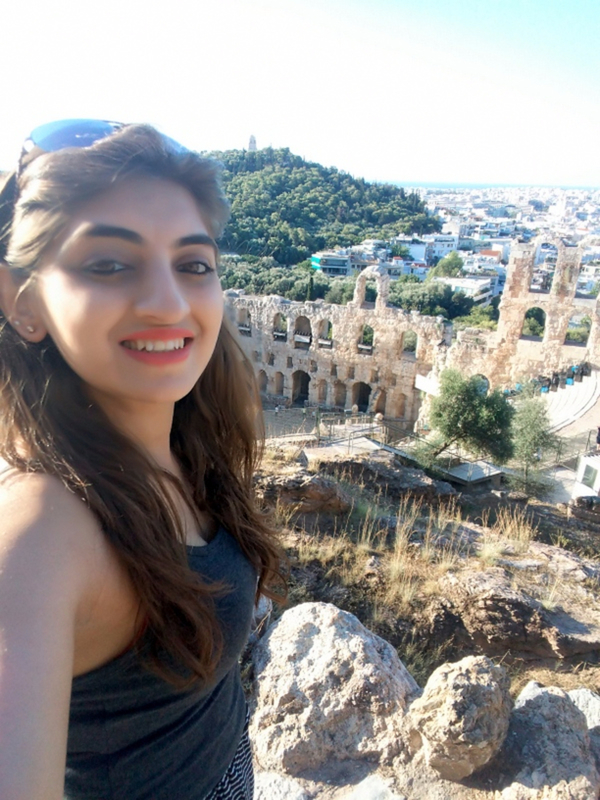 So after a lot of research, we decided to travel to Greece & Italy. We dedicated two or so days to all the cities travelled within Greece & Italy, and the tour was for about a little less than 2 weeks. 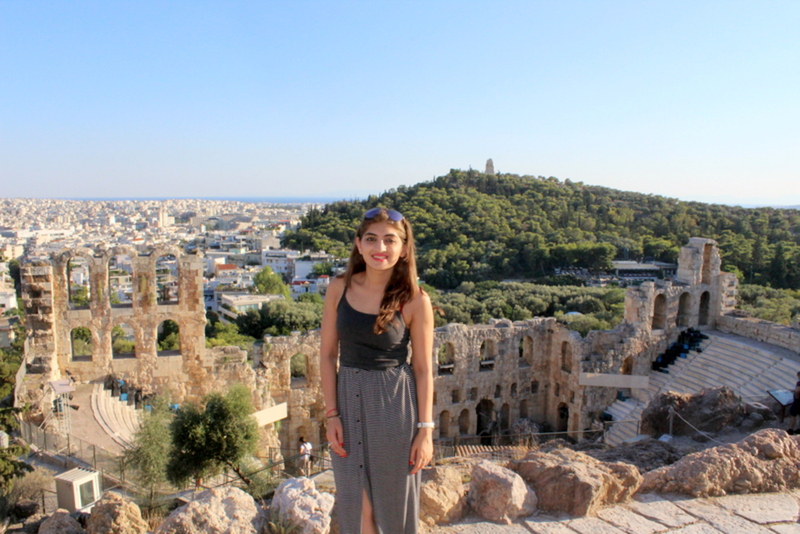 Our First stop was at Athens, and it was one of most comfortable stays throughout our trip. We checked into to The Royal Olympic Hotel which was central & almost equidistance to every tourist spot in the city. We had no complains about our stay, the rooms were quite good, they had a great spread during breakfast with a beautiful view. Not enough they had their basic facilities such as the pool & other things. 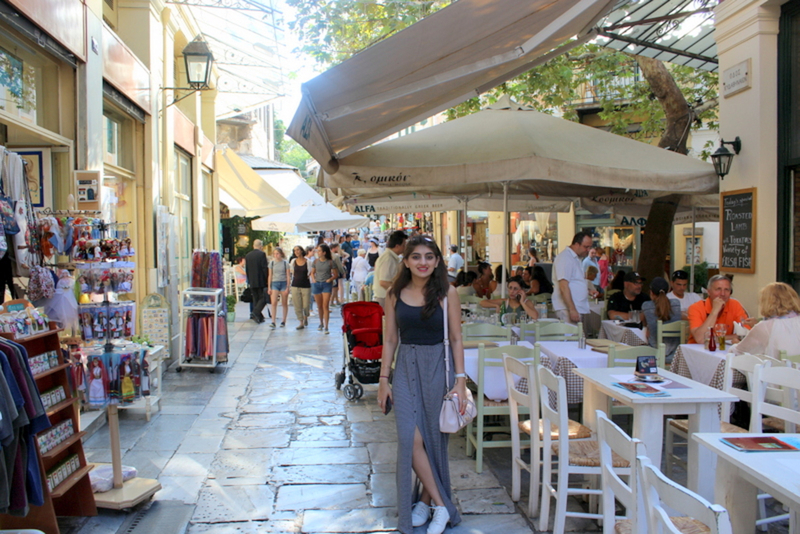 We were more keen on exploring the city since as we had just two days so we checked in & went out to explore starting with one of the most well known areas named Plaka. 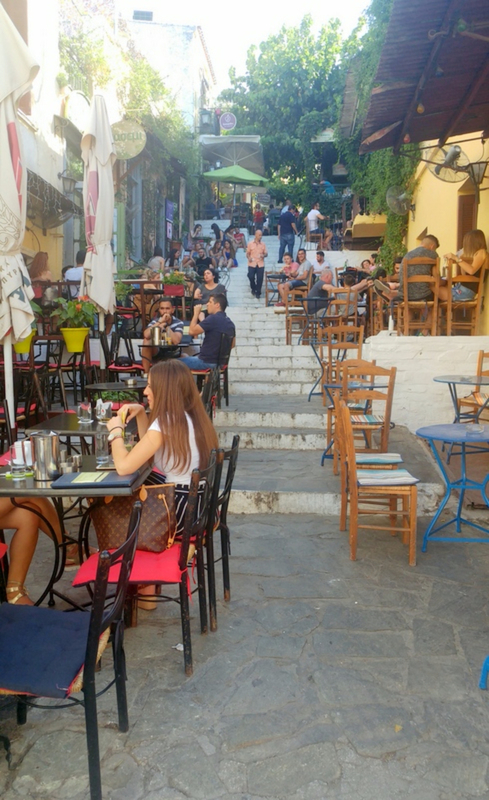 Plaka is a huge area with tiny streets full of restaurants, cafes and shops, and we ended up having most of our meals there. 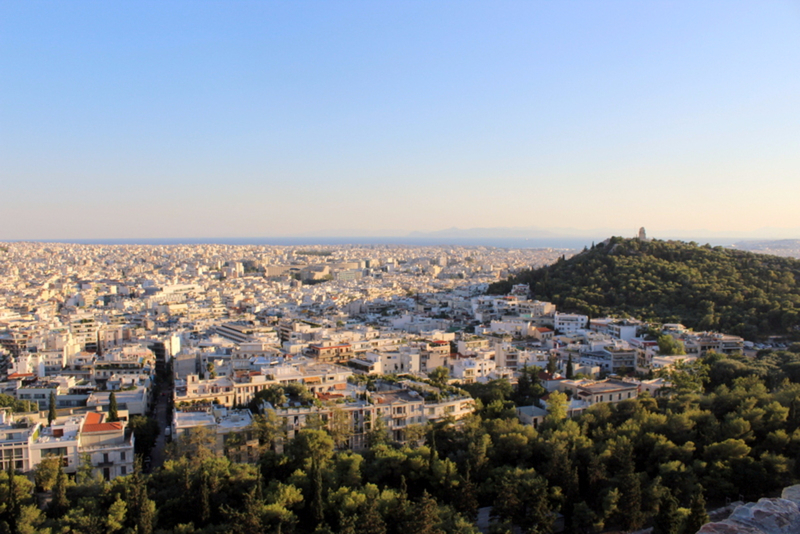 The way to almost all historic monuments is through Plaka so every visitor mostly choses that route. 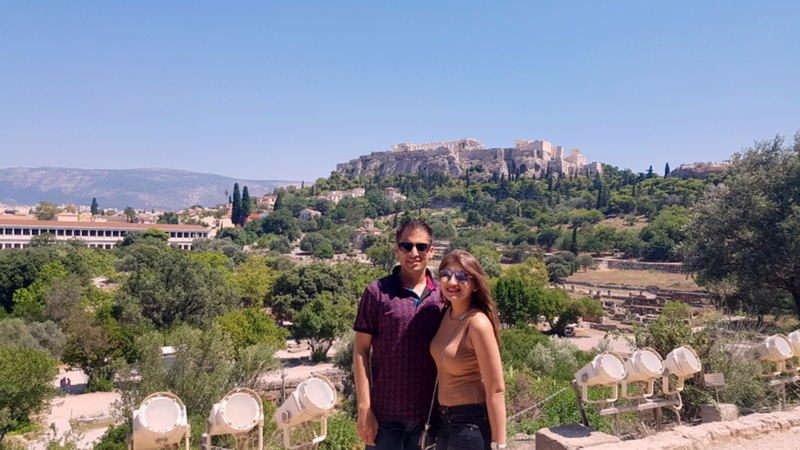 It is a pretty long walk to the Sacred Rock of Acropolis, and we passed through some of the ancient monuments along the pathway. 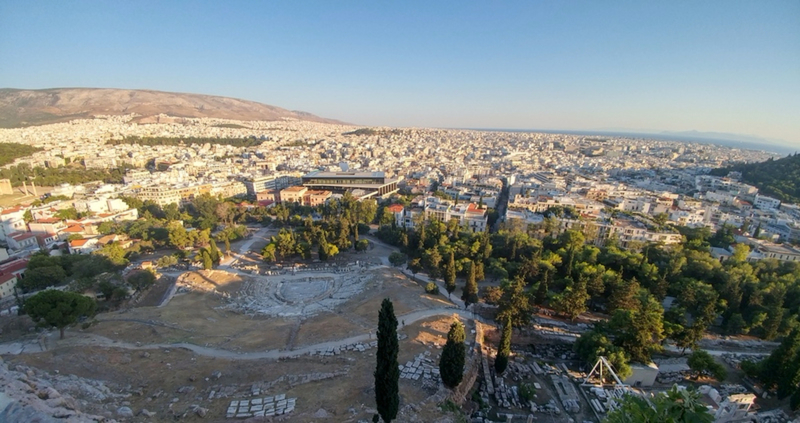 Built at the foot of the Athenian Acropolis was the Theatre of Dionysus Eleuthereus, which was one of the major theatres in Athens which was one the first theatres ever built & could seat up to 17000 people. We got a good view of it even from the entrance of the Acropolis. 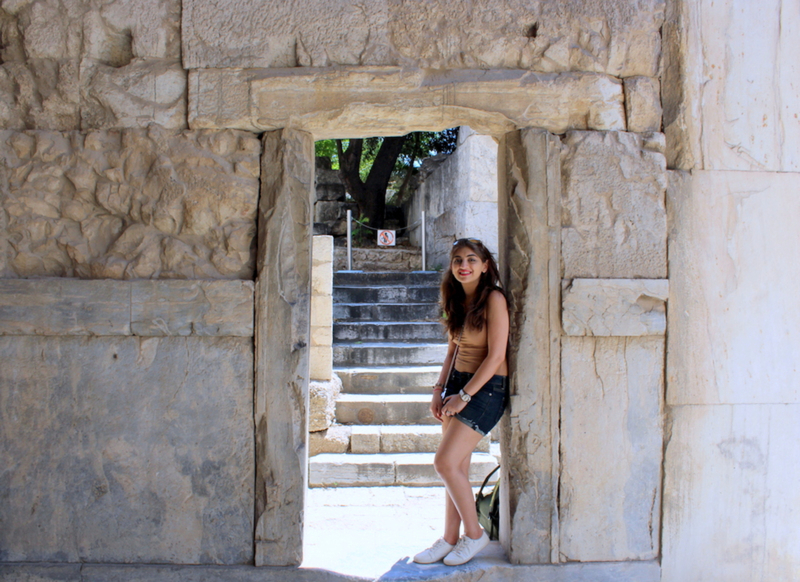 When entering the Acropolis, every visitor passes Propylaea, so did we - it is the monumental entrance, which combines a wide stairway and two colonnaded halls on the sides with roofed corridor in between. In the ancient history, those walls were decorated for the visitors, though not much remains of the walls now. 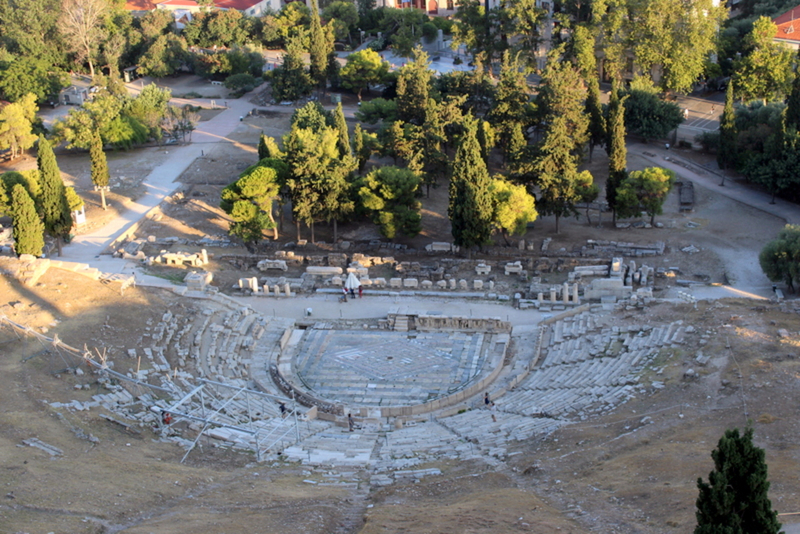 While walking up the slope, we also saw the Herod Atticus Odeon. 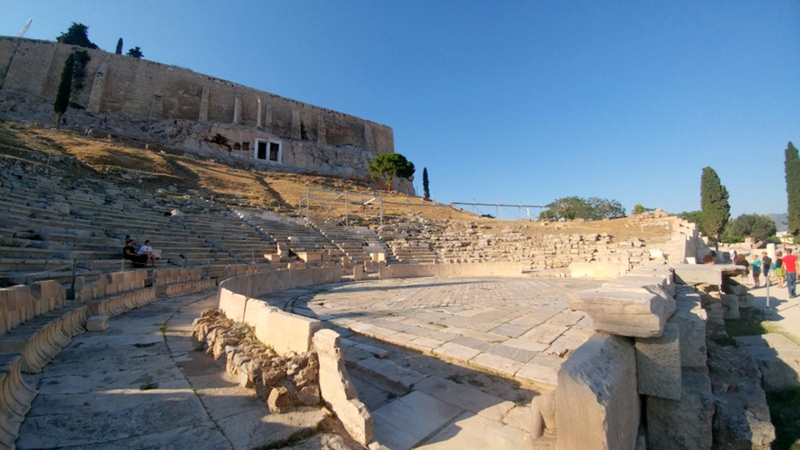 Odeon of Herodes Atticus is the stone theatre built in 161 AD and is rather well preserved, even in the recent past, a lot of shows were conducted at this historic monument. 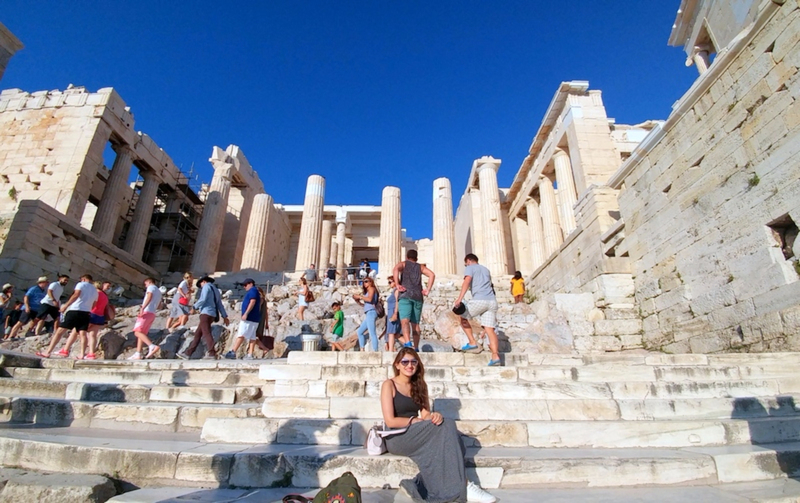 We went up the Propylaea, to see the Temple of Athena Nike located on the Acropolis, named after the Greek goddess Athena Nike, built around 420 BC, it is one of the earliest iconic temples of the Acropolis. 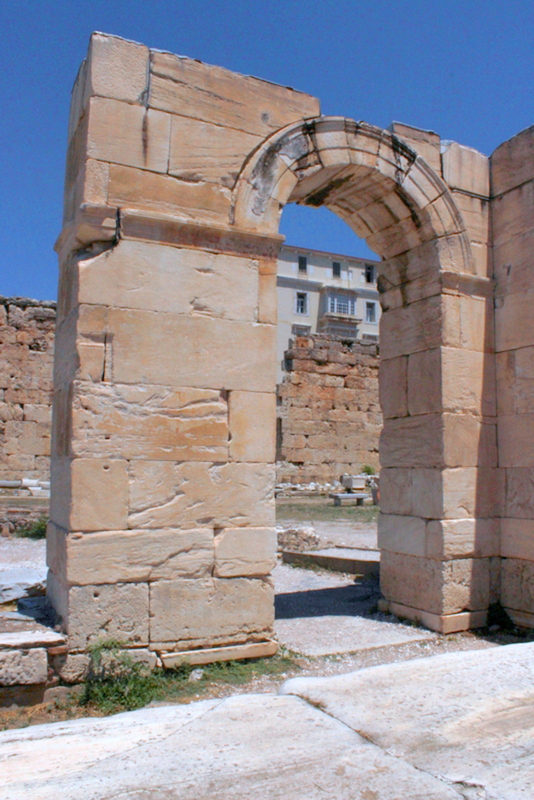 It is the first building that greets the visitors who approach the Propylaea. 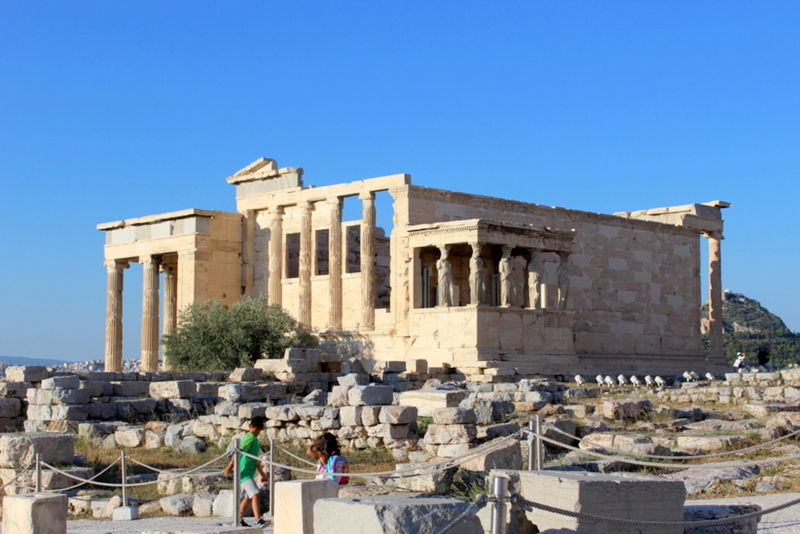 The Classical temple is considerably smaller than the other temples of the Acropolis. Built within that area was the Erechtheum, an ancient Greek temple to replace the older Temple of Athena due to the Persian attack. The famous six statues (that you can see in the picture below) of caryatids by Callimachus Nike from the porch of this particular Temple represent young women from Karyes of Laconia who danced in honor of the goddess Artemis. Temple of Athena Parthenos is one the most known building of Ancient Athens, it is a Doric temple dedicated to city´s patron goddess Athena. Building is currently under restoration and conservation, so it is practically not possible to get any picture of Temple without lots of construction materials, cranes and other metal stuff laying and hanging around it. 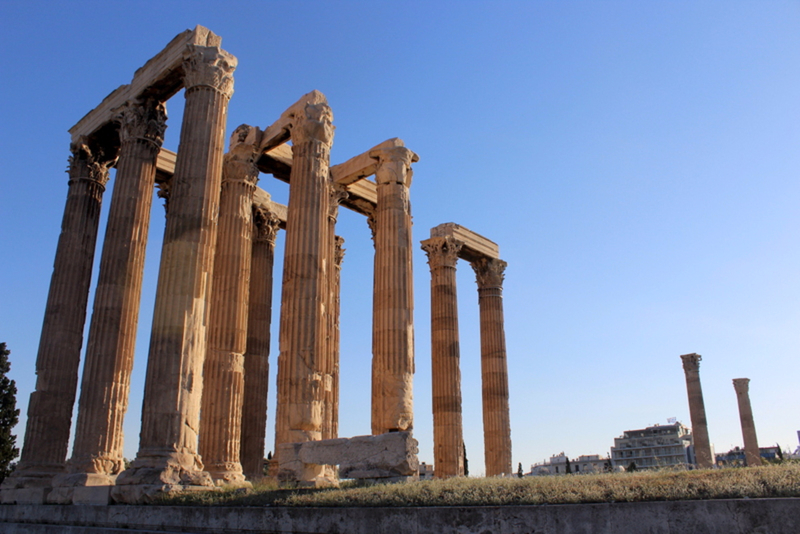 The construction work to preserve & maintain the Parthenon has been on since 1975. 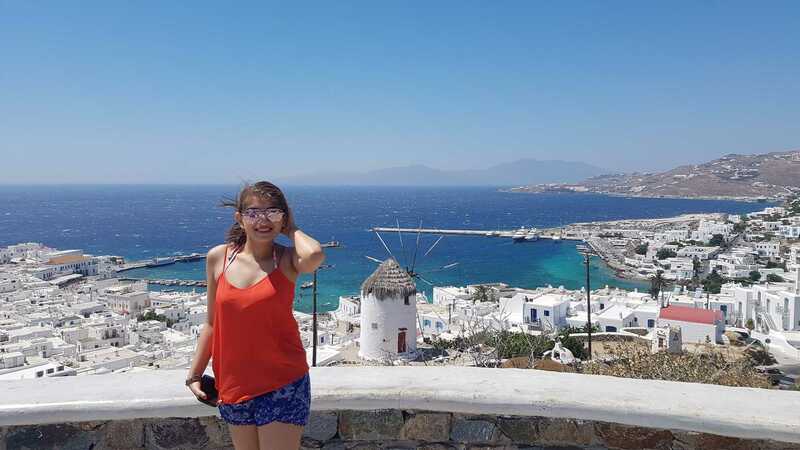 We spent some time at the Acropolis, taking whatever possible pictures we could, especially pictures of the view from the top. It was like seeing whole of Athens from that point. We took a lot of photos here as it was worth the climb up the hill. 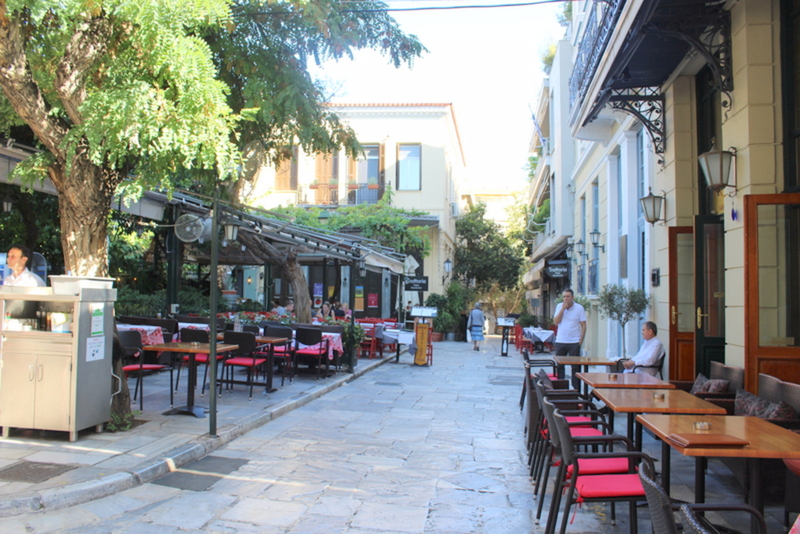 Since we had to pass by Plaka again, we decided to try some more new cafes on our way back. The area is not restricted to only cafes & restaurants but also has bars with some exquisite greek liquor. Though Athens is definitely not a place for the late night culture, at least we did not witness any such parties or clubs in Plaka. After our hopes to party were crashed we decided to just head back to the hotel & relax. 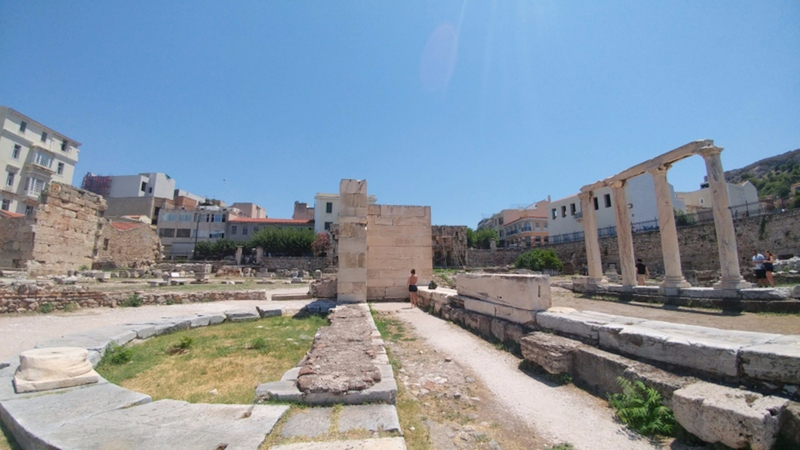 We had almost seen all the major architectural attractions the previous the day so we went exploring the Ancient Agora, Roman Agora & the Hadrian’s Library. These were the last few places left of our list to cover. 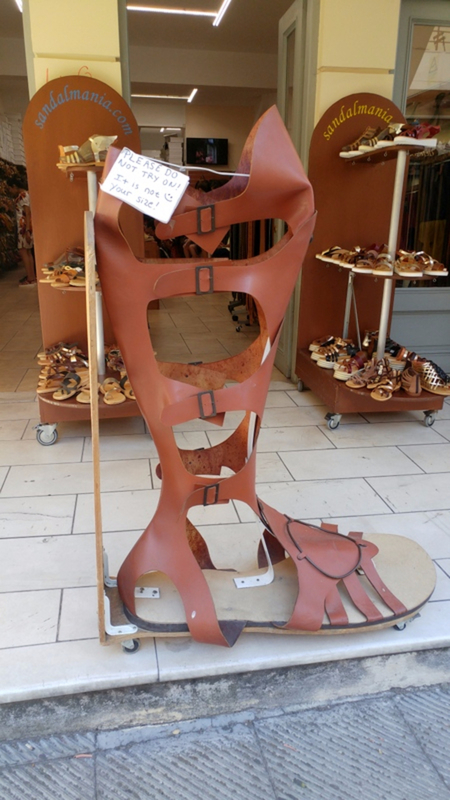 One can see the city's major tourist attractions by simply walking. We had walked so much that we kept looking at our phone to see the numbers of steps we had taken, lol. Oh, and the weather was really hot & sunny, we were grateful for the Gelato ice cream parlours, which were on almost every street of Plaka. One thing we did experience when it came to food, was even after the 'n' number of restaurants present there, not many had enough vegetarian food. Our trip throughout Greece made us realise that being a vegetarian is tough and so tough that we lived on pastas & pizzas. Of Course not just basic italian but we tried some of the best Greek salads. 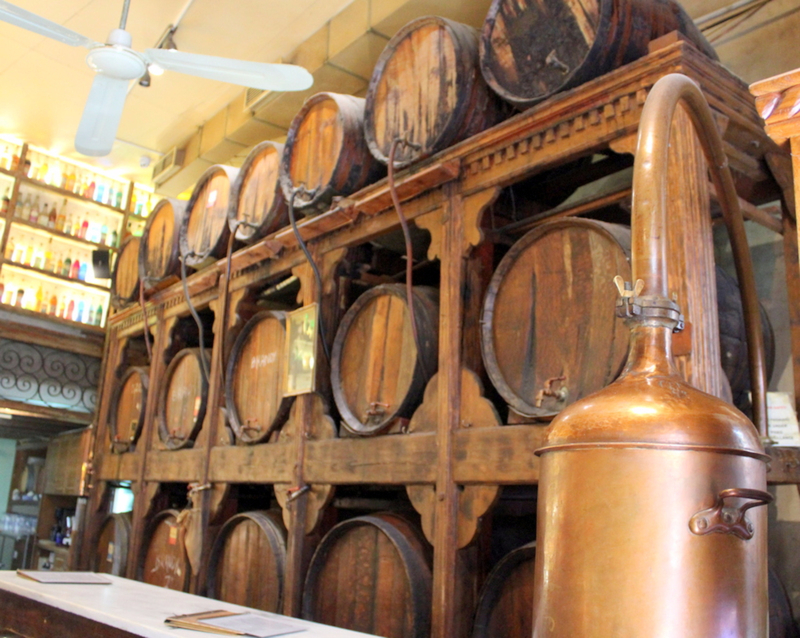 Also, one just should not miss visiting Mr. Brettos, one of the oldest wine distillery built within Plaka. It originally started operating in 1909, but till date a popular one. Even though the shop is small, it still operates as a bar and serves visitors more than 36 different flavours of liqueur. They still have some old barrels full of spirits that are used even today. 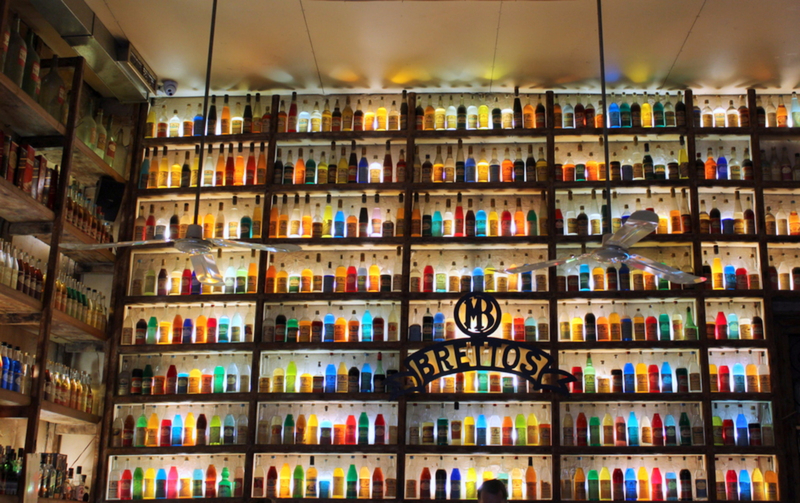 When entering the store, the first thing we noticed was the beautiful decor of a wall full of colorful bottles lit from behind. 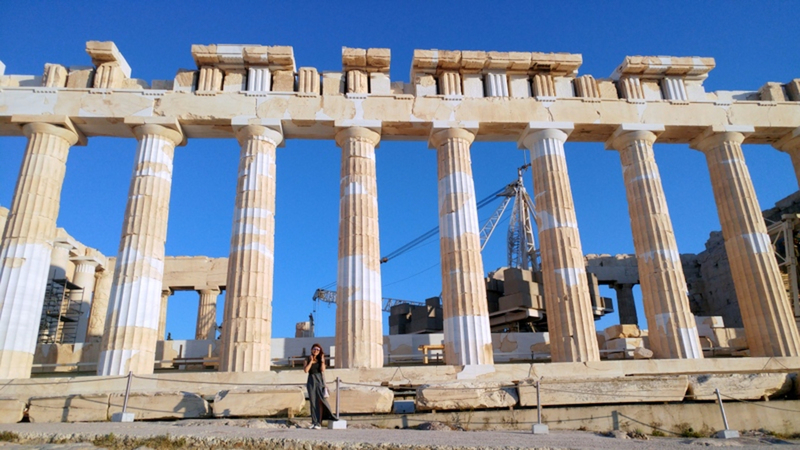 It is a must visit if anyone decides to travel to Athens. 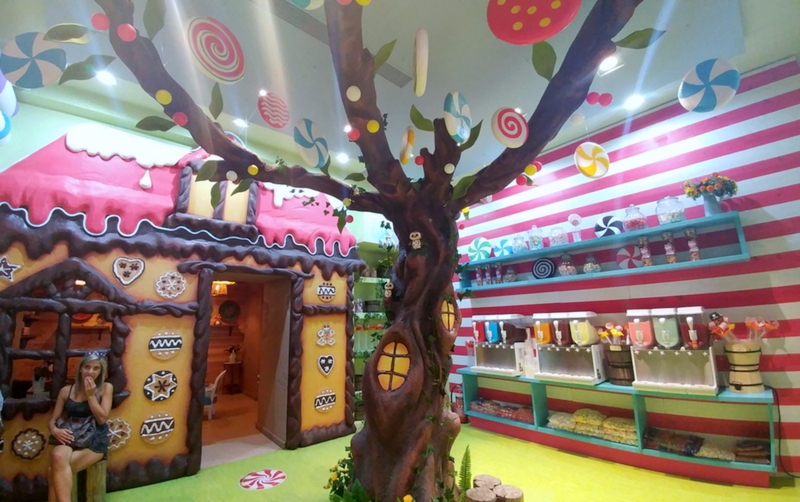 Another very interesting place we came across was the Hans and Gretel Store in Plaka. 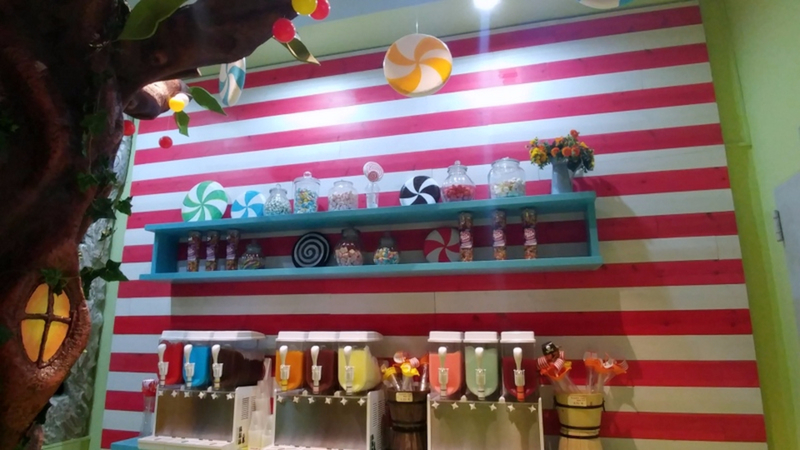 One of the most innovative & cutest candy stores in the city. They have some really delicious candies & deserts. The store is so cute that one can just walk in for the theme & interior set up. 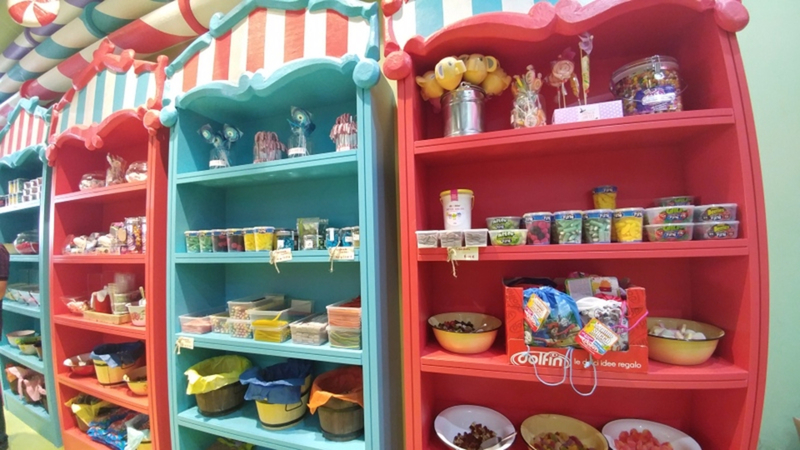 The famous Hans & Gretel store in Plaka market. We then headed to the Roman Agora, though there weren’t any remains left as such to see in the monument so we went ahead to the Hadrian’s Library. On the site of Roman Forum there are ruins of Library built in 132 AD by emperor Hadrianus. The building was rather big, some 100 by 80 meters, though unfortunately not much of it remaining, just a wall and a few columns. After which we explored the Ancient Agora, and by the word Agora they meant marketplace in the ancient times. 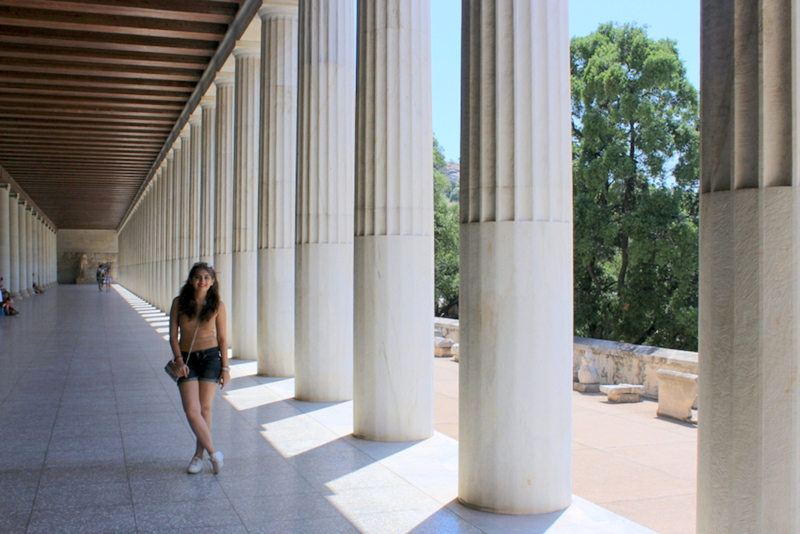 The path to the Ancient Agora took us to a point where we got a panoramic view of the whole area, which consisted of two major historical monuments, The Temple of Hephaestus & the Stoa of Attalos. 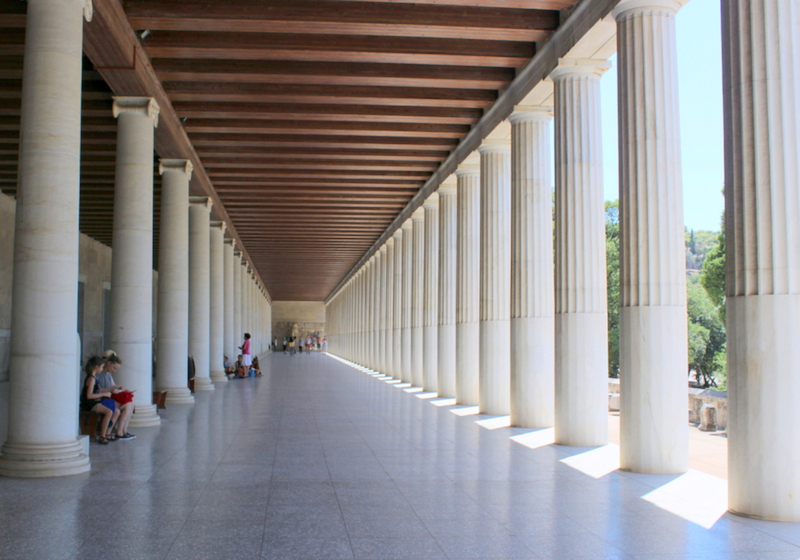 The Stoa of Attalos houses the Museum of the Ancient Agora. The museum had a collection of clay, bronze and glass objects, sculptures, coins and inscriptions from the 7th to the 5th century BC, as well as pottery of the Byzantine period and the Turkish conquest. Since it was my first time to Europe, I was super happy to witness the late sunsets, as late 8:45 p.m., which also gave us more time for sightseeing. 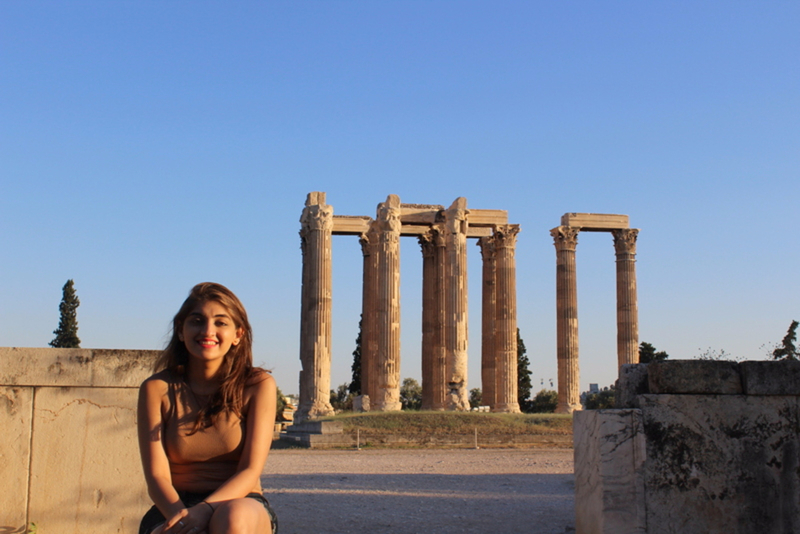 So we went to the last tourist spot, The Temple of Olympian Zeus, a former temple dedicated to Olympian Zeus, a name originating from his position as head of the Olympian gods. 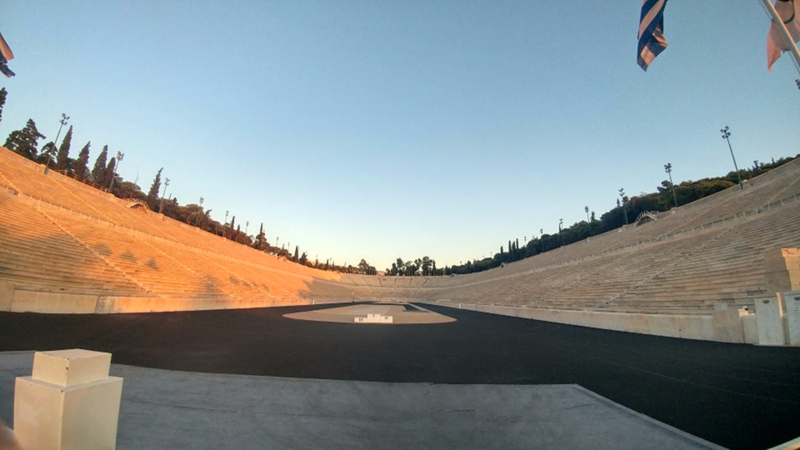 We further walked from there to see the Panathenaic Stadium, where in the first modern Olympic Games were hosted, in the year 1896. With that, our second day also came to an end and it was already time to head to our next destination. Any guesses? Stay tuned!